such lovely things: Read any good books lately?? I really love the summer holidays, I do! In the run-up with at least 101 things to do every day, I can't wait for school to break up. I absolutely love knowing that the alarm won't be going off, that I won't have to shepherd small-ish people out of the door by a certain time, and that most of the running around from here to there will calm down. Suppose I look forward to not having so many responsibilities and pulls on my time. In reality, time still flies by! There are just not enough hours in the day! Our days are indeed filled with craft and cooking and visiting and playing and reading, but not always in quite the relaxed way I had in mind!! C'est la vie!! So, my reading list....suddenly I'm not so sure I'll get through any of them! I'm going to have a quick peruse of the Spanish book in the hope that this year I can say more than Holá! and Gracias. 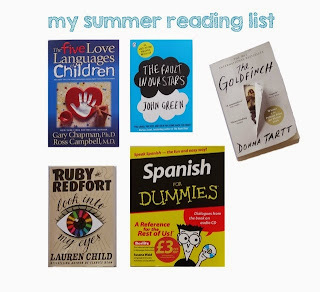 Since my eldest daughter loves me to read to her at bedtime, I think Ruby Redfort is the only one I can guarantee will be finished before school starts again! The Five Love Languages will be a 'dipper', I'll read a bit here and there and gradually make my way through it. Some books are good like that, aren't they? I desperately want to read The Goldfinch since I've heard such good things about it, but wow, it's a big book with teeny tiny writing! Is it just me or do others find that daunting, too? I'm not sure I'll be able to read this in time for our next Book Club! I've been reading more books on my Kindle app recently but I really do love holding a real book (and find reading in the bath too scary with my iPad in my hand! ), so thought I'd get this in hard copy. I'm now wondering if I shouldn't have bought the kindle version after all! Perhaps this will be my true 'holiday book'. Perhaps lying beside the pool with the sounds of the kids splashing about in the water might be the ideal time. What's on your summer reading list? Do you even have a list?? That's a good list - I just read Gold Finch for my book club (I wasn't that impressed actually and it was a hard slog) . The languages of love is a great book and it really has helped me over the years managing my expectations of my children. Happy reading! I agree about The Goldfinch! I took me ALL summer, which wasn't quite the plan. Lovely writing but could have easily been edited... Now onto the rest of the books on my list.